The beginning of this month marked the thirtieth anniversary for me and my viola made by Hiroshi Iizuka. Earlier this year I also acquired an Iizuka violin made out of bird's eye maple. Both are in the picture above. I was really fortunate to get such an instrument at the age of twelve! My viola teacher, Emanuel Vardi, had recently gotten one of Iizuka's instruments and recommended I get one, too. To celebrate our anniversary, I offered to play any of the Bach Sonatas and Partitas (on the viola, of course!) before our already-planned duo recital on the 16th. Twenty-one years earlier-- and on my twenty-first birthday-- I had performed the complete set of Sonatas and Partitas from memory, so this seemed like the right unaccompanied music with which to celebrate this occasion. Hiroshi Iizuka was born in Maebashi, Japan on July 21, 1945. He apprenticed in Tokyo under Soroku Murata, Geigenbaumeister, from 1971 to 1973. From 1973 to 1977, Iizuka apprenticed under and worked for Josef Kantuscher, Geigenbaumeister, in Mittenwald, Germany. He acquired a Journeyman’s diploma from the German Chamber of Handwork in 1974, with a prize for the violin made for the examination. Iizuka established his own shop in Pennsylvania in the United States in 1977. Since then, he has worked predominantly in the building of new instruments. Besides the traditional style of violin-family instruments, he developed his own model of a “viola d’amore” style viola in 1979, and the “rubenesque” model in 1992. Iizuka has made more than 380 instruments that are being played worldwide, over half of which are violas. He has made 7 celli to date. His instruments are played by many well-known soloists and chamber musicians, as well as in leading orchestras worldwide. October 21, 2016 at 04:56 AM · WOW what a performance, Scott, I listened from start to finish. I'm particularly floored by this beautiful performance Bach's longest (and hardest, surely, by any measure) fugue. And the Chaconne on viola, wow what a treat. Did you make up that cool little tag at the very end that refers back to the very beginning of the Partita? Making it end on major chord! Nice. October 21, 2016 at 01:18 PM · Thanks, Laurie! Yes, the tag is my own. I figured if the partita starts that way, maybe it could end that way, too. Thanks for listening! October 21, 2016 at 01:35 PM · Nice Musafia case as well!! ?? October 21, 2016 at 01:44 PM · Must be wonderful to have such a long "relationship" with a single instrument. October 21, 2016 at 02:45 PM · I like your tag on the Chaconne too. Whenever I play a piece that ends in a "tonic-TONIC" note pattern, especially in low register, I think about an immediate segue into the Allemande. If I am just noodling around, sometimes I even will play it out just as you did (that is, just the first phrase, which returns to the tonic via the dominant), regardless of the exact key. It could be a great jazz tag (e.g., for a modal blues), I've got to think about that some more. Of course Bach used this "tonic-TONIC" motif all the time but I think the opening bar of the Allemande is the iconic and definitive example. And your Picardy third ... cleverly bringing a smile to your whole audience for sure. 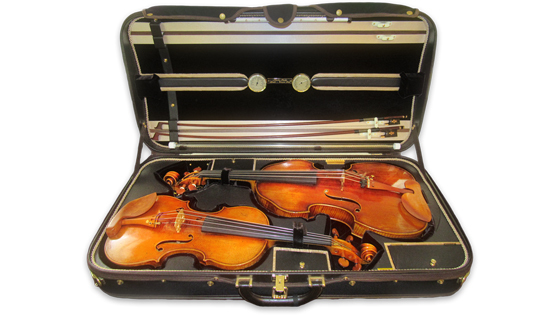 Your instruments look so wonderful, relaxing together in that beautiful case. But will you please add (perhaps here in the comments) a photo or two of your birds-eye violin, so we can see the back? October 21, 2016 at 04:11 PM · Paul, here is a picture of the back and here is a picture of the rib. October 21, 2016 at 04:54 PM · So, not being much of an expert on the wood itself, does "bird's eye" refer to those little circles in the maple that look like eyes? What are they, little knots in the wood? October 21, 2016 at 08:23 PM · I do think that's how it got its name....but I also don't know much about the wood itself. Violinist.com luthiers: any information is welcome! October 22, 2016 at 01:20 AM · Laurie, the answer to your question is "yes." And when you turn the wood, the eyes seem to move because the figure is three-dimensional in the grain of the wood. Varnish tends to bring out that "motion." Next time you are at a violin show get ahold of one and turn it slowly while you look at the eyes. I've got a bird's eye violin too, and I'll email you a photo of it to link to this entry. I don't know how to attach a photo otherwise. Unfortunately, while it's a pretty violin, it sounds absolutely miserable and it's 7/8 size. October 25, 2016 at 12:50 AM · I watched the video. Very well played. It sounds incredible. Thank you for sharing. October 25, 2016 at 03:38 AM · Oh Scott, that was awesome. How nice to hear you play again. Just beautiful! October 26, 2016 at 09:22 PM · Is Mr. Iizuka still making these sloped shoulder violas? How big are they? How much are they? How to contact him, please? Beautiful playing. The viola brings out the depth (no pun intended) of Bach's amazingly spiritual music in these works for strings.